Winter's short, cold days and longer, colder nights keep us snuggled up close to the fire. As we reflect on the mesmerising flames, their flickering warmth reaches us on the inside as well as the outside. If your quiet thoughts are interrupted by a grungy or crumbling fireplace interior, there is hope. The Fireplace Warehouse has a new innovation in fireplace upgrades that allow you to update the interior of your firebox with quality materials at budget pricing. 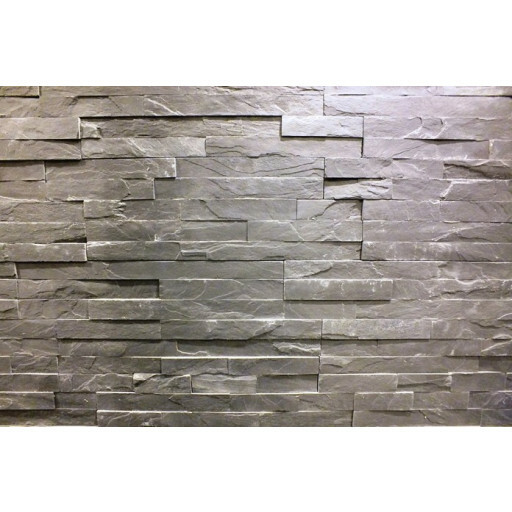 Wall stone panels are all natural stacked stone slabs that are ready to install in your existing fireplace. These panels work in any firebox, whether it is electric, gas fired or solid fuelled. The mini black wall stone panels of stacked, unmortised, slate-look stone will enhance any fireplace surround or room décor. They can be installed behind wood stoves to provide fire resistance to walls and offer some radiant heat value. They may be used to create decorative features on walls or as a wall covering in their own rite. The panels are approximately 400mm x 150mm each. One box of the mini black wall stone panels will cover 0.5m2. They are available online or in our stores. I PURCHASED 5 BOXES OF WALL TILES IN MINI BLACK FOR THE WALL BEHIND MY NEW FREE STANDING STOVE WHICH I HAD ALSO PURCHASED FROM THE FIREPLACE WAREHOUSE STORE IN BURNLEY ON ACCRINGTON ROAD LOOK FANTSTIC AND WILL STOP THE PLASTER FROM CRACKING. Done one wall in my bathroom with these tiles and it looks so modern, completely changed the room.